The event hosted a great number of tech enthusiasts, developers, CXO’s, founders and investors. It was held on June 28th at the Trask Event Center in port of Tel Aviv, and we were there! Our CEO Miroljub Boskovic visited Israel, attended the conference and had the opportunity to listen to several great speakers telling more about what’s happening in Israel when it comes to tech startups, how to inspect the market, create a team, make right decisions, and finally get funded. In addition to the usual conference agenda and networking party, a pitch-off competition was a chance for 10 selected startups to show what do they have, and contest for valuable awards and participation on TechCrunch Berlin in December. After the conference, Miroljub stayed in Tel Aviv for few more days and met several startups from Tel Aviv’s Startup Hub, with whom we organized meetings in order to present our services as dedicated IT consultants. He also visited several tech drinkabouts and made some great contacts within local IT community. As a result, we are negotiating the cooperation with two interesting startups from FinTech and InsurTech, who will be the cornerstone in our desire to expand business services even more in the Middle East. Our company has annual team building for our teams, and this year’s team building happened in Zlatibor, from September, 22nd to September, 24th. 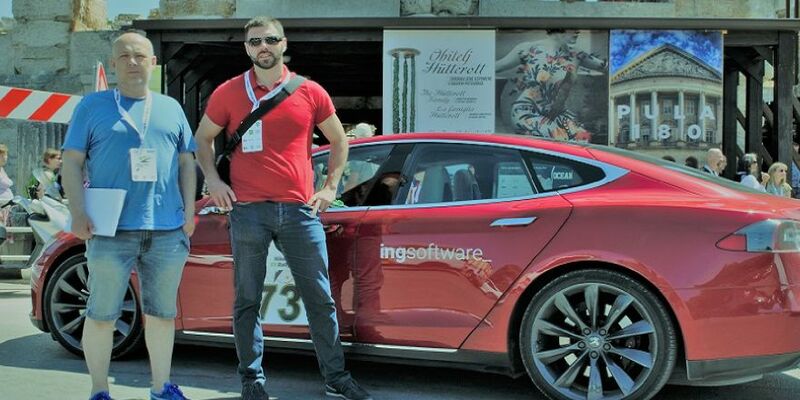 Conceived as the quietest and most beautiful car race ever, Nikola Tesla EV Rally was held from May 31st – June 7th in Croatia.